I met Mr. Paul Elmer More several times, but had an extended conversation with him only once. I wrote down a record of it at the time and give it here, as I wrote it then, embedded in a Princeton week-end. I was taken to Mr. More's house by Dean Gauss, who was one of his closest friends at Princeton and who on this occasion wished to consult him. At that time—this visit took place in the December of 1929—compulsory chapel had been partially abolished at Princeton, but it had been found desirable to make the students attend half the chapel services on Sundays in order to keep them in town over the week-ends. Those students who professed unorthodox views—and who were often, as it turned out, the same ones who wanted to spend Saturday nights in Philadelphia or New York—were obliged to attend non-sectarian religious discussions which took place on Sunday evenings and were conducted by members of the faculty in rotation. That month it had been Dean Gauss's turn, and he had begun on his first evening by attempting to find out how much the students knew about or were interested in religion. It had turned out that, though several boys believed in Heaven, nobody believed in the Devil; and when he had chalked up a list of theological words beginning with infralapsarian and supralapsarian and ending with theism and deism, it had been obvious that nobody knew anything about any of them. In dismissing the class, he had invited them to hand in questions which might stimulate discussion; and the sole response to this had been a letter written in Latin by a freshman and expressing a desire to learn something about Mithraism. Dean Gauss had decided to brush up on the subject by calling on Mr. More, who had the history of religions at his fingertips. Mr. More had at that time just built himself a new house in the new residential section of Princeton near the Graduate School, and we approached it along a rainy new-laid pavement. The sitting room, where we waited a few moments, was comfortable but rather somber. With its walls densely lined with books, it was preeminently the room of a scholar—though there were a few carefully chosen articles of ornament: two small panes of Dutch stained glass, for example, which Mr. More had brought back from Europe and had had inlaid in a large window at the back. But Mr. More did not make us wait long: he appeared almost at once, brisk enough, and greeted us with an alertness and an evident pleasure at having people come to see him very attractive in a man of sixty-five. He was short and had picked up some of the plumpness that goes with a sedentary occupation. He had a Roman nose, a pale gray eye and an iron lock of hair on his forehead—in general, a peculiar iron-gray aspect. There was in his face much strength and some nobility, but a curious absence of color. Affably he attended to the tea and began talking about T. S. Eliot, whom he had suggested inviting to Princeton to lecture. I was surprised to see how much he admired Eliot. He told us, in reply to our questions, that Eliot was "tall and thin, quite strikingly good looking," and that he, More, had gone to Eliot's house in London and had met people there. He explained to us that Eliot's grandfather had been chancellor of Washington University in St. Louis at the time when he, More, had been a student there, so that he had already known Eliot's family. And as he went on, I came to realize that it was for him a matter of deep gratification to have made the acquaintance of another writer of high intellectual distinction who had come like More himself out of that old Middle Western world, who had the freedom of that literary life of Europe from which More's Puritanism had largely shut him out and who was able to bring More into contact with it—a man who, with all his brilliant reputation, his position as a god of the young, was yet a scholar and a serious critic, preoccupied with problems of morality, and striving, although by a different route, precisely like More himself, to find his way back to the Christian religion. We talked about Eliot's influence among the students, and More demurred over Eliot's poetry. I asked him whether he didn't admire "The Waste Land." "Well, one can see," he conceded, "that it's written by a man of parts." But it seemed to be "The Hippopotamus" which presented the most serious difficulties. "I must say that it reads aloud very well," he confessed, but he couldn't understand what Eliot meant by it. I suggested that it was a satire on the Church. "But," Mr. More protested, "I can't understand how Eliot reconciles that with his present position." I said that, after all, Eliot had written the poem many years before; but Mr. More only shook his head and repeated that he could not reconcile those two things. Nor could he follow Eloit's enthusiasm for Baudelaire: "It seems to me he finds in Baudelaire . . . things that aren't there." I admitted that there might be something in that, but asked him why he could not admire Baudelaire. "Why," he replied—he had an abrupt hesitation, as over the difficulty of dealing urbanely with a subject about which he felt so strongly, with an author of whom he so greatly disapproved, and whom, if he had been writing an essay, he would certainly have treated with stinging indignation—"I'm old-fashioned about Baudelaire. I recognize his power—and his significance in his time—but as a guide to life—!" He stopped, and neither Gauss nor I tried to debate the matter further. It was the moment of the great controversy over Humanism, and we tried to draw him out on this subject. I had been hearing from a friend at Harvard of the belief of the fanatical Babbitt that his doctrine was gradually but surely taking possession of all the ablest minds of the time and of the legend, circulated among his students, that the old man had a great map in his study and stuck a thumb-tack into it at every point where a Humanist center was supposed to have sprung up. But Mr. More was much more sensible and less pretentious. When Gauss asked him whether he felt it was true that a great tide of Humanism was rising: "Well," he replied, "I'd rather say that it was having a great splurge just now, but it's partly based on misunderstanding." Yet he spoke with evident satisfaction of an article on Stuart P. Sherman which Seward Collins had recently published in The Bookman. Sherman had been the favorite disciple who had turned renegade to the Humanist band—the split had come when Sherman first praised Whitman—and Seward Collins had now repudiated Sherman. "It seems," remarked Mr. More, "as if something like a conversion had occurred there." Gauss and More discussed their first acquaintance. The Dean in those now remote days had been a young journalist and poet, just back from the Paris of the nineties, with long yellow hair and a flowing Latin Quarter tie, and he had written a furious letter of protest to More over a review of some French life of Sainte-Beuve which the latter had published in The Nation. "It wasn't a slating, was it?" said More, almost chuckling at the memory of past ferocity. "It was just a bit—contemptuous." He had answered Gauss's letter and received a second letter equally violent. Then he had invited Gauss to lunch and had found him, he said, quite amiable and mild. One of the great sources of More's strength, I realized, lay in the fact that he always knew precisely what he thought and was always ready to face anybody down, uncompromisingly and promptly. I looked at Gauss: his golden locks were gone and had left a prodigiously high domed bald forehead. With his fine profile of a blond South German Dante, in his Princetoniare soft shirt and tweed golf suit, he sat today, lying back in his chair, the great expounder of French romanticism, hobnobbing with the great Anti-Romantic. So much subtler a mind than More, with so much wider a range of imaginative sympathy, and correspondingly so much less fixed in his opinions, he looked out coolly through his eyeglasses without rims on those prejudices and principles of More's which years ago had aroused his indignation. The amenities and responsibilities of Princeton had dimmed the flamboyance of his romanticism. But Paul Elmer More, still just as positive, still nearly as narrow as then, sat attentively forward in his chair, still ready to face anybody down. Dean Gauss now remembered Mithra and asked for light from Mr. More on the subject. Mr. More, who had the pride of learning, replied with immediate gusto: "Why, I don't suppose I know any more about Mithraism than you do, Christian! "—At this moment there came into the room a sister of Mr. More's, who lived with him. She was a pleasant old lady, with none ofher brother's asperity—dressed in black and very deaf. She had just been going through her bureau-drawers, she said—"And it's so hard to know what to throw away! It's really not worth the trouble trying to sort things!" Mr. More admitted rather perfunctorily and speaking loudly so that she should hear, that this did constitute a perplexing problem, and quickly brought the conversation back to Mithra. "Well," he demanded in a brisk businesslike manner, pouring his sister a cup of tea, "what d'ye want to know about Mithraism, Christian?" His voice, nasal, clear and Middle Western, had a suggestion, not unattractive, of the homely plainspoken manner of the old successful American banker or merchant. "The Mithraic bee," began Gauss, "was a symbol of immortality"—"I've never heard of that," Mr. More caught him up. "Where'd you find that?" "I can't remember where," replied Gauss. "That's what I wanted to ask you. I read it years ago in some book and I can't remember now what it was. I thought you might know." But Mr. More did not know: he mentioned all the books he had read that dealt with Mithraism and said that there was nothing in any of them about it. What he knew, it was plain, he knew: he needed to consult no index. "I suppose," Dean Gauss pursued, "that the bee came to stand for immortality through the belief that bees were bred spontaneously in the carcass of dead animals. It was really the carrion-fly. Virgil talks about it in the Georgics." "The 'out of the strong came forth sweetness' of the Bible," put in Mr. More. "Yes," said Gauss. "Clovis was a Mithraist"—"That I didn't know," said Mr. More. "Yes, Clovis was a Mithraist," the Dean pursued, "and his emblem before his conversion was the bee." "Is that a guess?" demanded Mr. More. "No," said the Dean. "I read it all somewhere, but I can't remember where." Clovis's bee, which Mr, More had never heard of and as to which, failing definite authority, he was not prepared to indulge in speculation, seemed to have made him a shade impatient. He delivered, however, a short lecture on what he did know about Mithraic myths; and it was amazing how much he knew and how accurately he was able to retail it. He traced Mithra, the God of Light, from the Vedic hymns into Persian mythology, and from the Orient into Greece, indicating his various transformations with confidence, lucidity and logic, but with a curious effect of his having retained them as ideas without their passing through the picture-making imagination. And yet the Mithra he described was alive, devoid of mystery, form or color though he was. It reminded me of a book called "Error's Chains," which I had used to look at in my grandfather's library and which had had many illustrations of the heathen gods, old line drawings done from paintings and statues.—Miss More was sitting beside me on the couch and could not hear the general conversation, so we talked separately from time to time while the discussion of Mithraism proceeded. "You might just as well take it all out and burn it up!" she declared, still thinking of her bureau-drawers. "When it's been accumulating as long as that, it's not worth the trouble to go through it and pick things out to save!" At this point Mr. Frank Jewett Mather arrived. He was a cheerful little man in a checked vest and spats, with the cocky pointed mustache of an old beau and the rosiness of a child. And he turned out to know a lot about Mithraism. He told us that it had had a great success with the Roman soldiers because it had promised them a sure immortality and that it had developed in the third century into a serious competitor to Christianity.—Mr. More's sister suddenly got up: "I'm going to burn up all that old stuff!" she announced, with the air of one who has finally arrived at a thoroughly satisfactory resolution—and she said good-by and went upstairs. —Mr. Mather explained in detail the symbolism of Mithraic art. There was a Mithraic bull in the Museum, he said, which he had bought arid brought back from Europe and which was one ofthe best things the Museum had. "I didn't know that," said Gauss with interest. "I must go over and see it. "It's the best Mithraic bull on this side," said Mather. "The only really first-rate one." It was a marble relief of the Sun God holding a bull by the horns; there was a dog which was leaping at the bull's throat and a snake which was attacking his testicles; the snake and the dog were Evil and Darkness. "Let's go over and see it!" the Dean proposed to me. Mr. More reverted to the days of The Nation. He told us that Oswald Garrison Villard had sometimes disapproved of what he wrote but had always had somebody else speak to him about it. Mr. More seemed frankly delighted at this evidence that Villard had found him formidable. "Afraid the 'inner check' wouldn't work!" Frank Mather impishly put in. But Mr. More possessed no technique to deal with people who made jokes about Humanism and did not deign to reply to this. "Who originated the term 'inner check'? Was it you or Babbitt?" asked Mather. "I was the first to use it," said More. In the Shelburne Essays. But Babbitt has made much more of it than I have." And he added, after a moment's pause: "I think the phrase occurs once in Emerson." In the course of the conversation that followed, Mr. Mather ventured to remark that he didn't see how Humanism was going to get us very far by going back to the Council of Chalcedon. Mr. More was then nearing the completion of his series of volumes on Greek philosophy and Christianity. A man of true spiritual vocation, unable to remain a simple rationalist but prevented by a Protestant education and an obstinate hard-headed common sense from finding a basis in the mysticism of Rome, he had devoted long and diligent years to establishing a historical tradition which would justify his peculiar point of view. At that time he had just published the volume which brought the line of development to its climax with the promulgation at Chalcedon in the fifth century of the dogma of the Incarnation—a doctrine which, in laying down the dual nature of Christ, in representing him as both human and divine, had seemed to Mr. More to make it possible for him to preserve the philosophy of Plato, so attractive to his intellectual and esthetic side, and at the same time not to cut himself loose from the supernatural authority of religion. So he made no reply to this gibe—but presently, with a shade of severity, accused Mather of being "a halfway Platonist like Santayana." He seemed to me that day very clear-cut against the background of the college community. He was himself not really typical of the American academic world: he was an independent scholar, who had denounced in the most vigorous language the lack of sincerity and incompetence of the colleges. He stood out, not merely through his distinction of learning, his Greek and Sanskrit and Hebrew and Persian and the rest, but by reason of his intense seriousness, his stubborn insistence on the importance of maintaining in one's criticism a consistent position which would face moral problems realistically, his refusal to allow himself to be seduced by purely esthetic or intellectual satisfactions. Gauss told him about a student at one of the Sunday-night meetings who had put himself down as a "synthetic hedonist"; More smiled, but said, "I wonder what he meant." We discussed an exhibition of modern art then on view in New York. Gauss thought Seurat essentially classical, but Mather insisted that he was decadent: Seurat's figures, he said, seemed tobe perfectly realized, but actually they were hanging in the air, like the characters of Proust or Henry James, with no real connection with anything. And this led us to contemporary writing. Mr. More, who in a recent essay had characterized Dos Passos's "Manhattan transfer" rather intolerantly as "an explosion in a cesspool," conceded now, with an evident desire to be fair, that he "recognized the element of protest in Dos Passos and Joyce." I said that, though there protest in Dos Passos, I did not believe there any in Joyce, and thus unfortunately deprived Mr. More of his only grounds for being polite about "Ulysses." He was afterwards to give more serious consideration to such writers as Joyce and Proust. The last book he published, "On Being Human," contained essays on these two novelists, which, uncongenial to More though the subjects were, show more grasp of what is really at issue in their books than most of the stuff which has been written to exalt them. The moralist in Paul Elmer More, who had always been at war with the poet and who had scored over him so crushing a victory, could always be counted on to understand the case of any writer, however abhorrent, who had a serious moral basis, even though the provincial prig who inseparably accompanied the moralist might prevent him from appreciating the artist's achievement. But at that time I do not think he had read "Ulysses"; and I myself was a little touchy on the subject, as my attention had just been called by Gauss to an editorial in The New York Times that morning in which The Times had ridiculed an appreciative article of mine on Joyce. Now I was further depressed, as it seemed to me that these three men, in their fields of literature and art certainly among the ablest in the country, were themselves disposed to outlaw from literature the greatest literary artist then alive. The same confounded old academic inertia, I thought; the same old proprietary interest in the classics which made them unwilling to believe that anything new could have great value! I remembered how thirteen years before it had been the same thing about Bernard Shaw. Dean Gauss had read "Ulysses," but had not liked it much; and, though it turned out that Mather, the old rascal, had read Mrs. Bloom's soliloquy, he would not commit himself on the subject. Paul Elmer More, who, as I say, had evidently not yet read Joyce, began by trying to handle the matter without heat, but when I talked about the Homeric parallel, at the suggestion of one of the major Greek classics' becoming involved with such a fellow as Joyce, his arrogance suddenly started up from behind his deliberate urbanity, and he sharply cut down on the discussion: "But Homer's Ulysses knew what he wanted. He didn't need special explanations!" It seemed to me that there were so many misconceptions lodged behind this remark of Mr. More's that I had difficulty in knowing how to deal with it. The conversation became rather confused and took a slightly acrimonious accent. Somebody changed the subject, and Mr. More proposed showing us his new house. We went upstairs. On one side of the hallway which led to Mr. More's study was a bookcase entirely filled with detective stories, which I was told he systematically graded with A's, B's, C's and D's. On the shelves of his study were Plato and Plotinus and the Fathers of the Church. Frank Mather mischievously inquired where the Acts of the Council of Chalcedon were kept, and More as usual made no reply. The study was a small unpretentious room at the very top of the house: it had one large morris chair and a table and a desk. On the walls hung two framed photographs, yellowish-brownish: one of Perugino's "Crucifixion" and the other of two battered Greek torsos, with both arms and legs broken off, awkwardly reclining together. They faced one another across the room, the Christian world and the Greek, and seemed to neutralize one another. Then we descended and took our leave. Still chafing at More's attitude toward Joyce, I asked him, just as we were going out the door, whether he had ever read Eliot on "Ulysses." He replied that he had not, and I told him that Eliot considered "Ulysses" a work of the highest importance. His whole attitude toward Eliot, so friendly before, as if by reflex action, seemed to stiffen. "I don't see," he retorted, "what 'Ulysses' has todo with Royalism, Anglo-Catholicism and Classicism! "—and added, "That young man has a screw loose somewhere!" "Would you agree with Huneker," said Mather, "that it's impossible for the same person really to like both Raphael and Goya?" "I don't think," Mr. More replied, "that that pair is particularly well chosen; but I should say that a capacity for enjoying certain authors made it impossible to enjoy Dante or Shakespeare or Milton—or rather, I. should say that, if a man liked certain things and claimed to enjoy Shakespeare and Dante, it would be impossible that he should really appreciate them!" On this implacable dictum we went. The next day I took a walk on the campus. It was dreary, misty and damp. 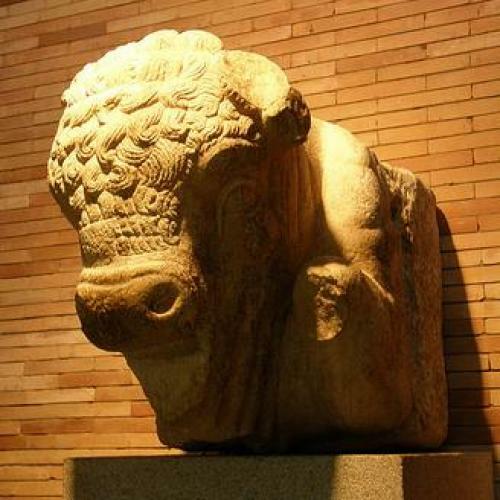 I remembered the Mithraic bull and decided to look it up in the Museum. There it was, sure enough, right opposite the front door as I went in, shining in the dim afternoon: the white marble relief of Mithra, a naked youth in a peaked Phrygian cap, clasping the sacred bull, which had the dog and the snake that were Darkness and Evil threatening its throat and its testicles. But the Sun-God was to kill the bull, and thereby to conquer the darkness and to make himself the creator of life, all the multiform life of the earth, which was to spring from the bull's ebbing blood. There they hung—once the light of those pagan caves to which the soldiers from their doomed legions had crept, once the Apollonian rivals of the Crucified—there they hung in the Princeton Museum on a Sunday afternoon! I went on to the glass-cases inside, but—Roman busts, Egyptian gods, Greek marbles—almost everything was a reproduction and gave me the impression of being denatured and canned. The afternoon light was gray, the rooms were becoming chill. I turned back and stood before the glowing Mithra, the only complete round living thing in the museum. I remembered with what amazement and exaltation I had first come upon the "Apollo Belvedere" when I had visited Naples as a child—how I had turned back to stare at its beauty. I went over to the University Library and sat down and wrote The Times a caustic letter about their sneering editorial on Joyce. Then I went to see if Gauss were free. He had been busy all the afternoon and had evidently seen a great many people: Sunday visitors. University business, protesting parents of students whom he had disciplined. He always gave his closest attention to anything that was submitted for his decision and dealt with it according to his most scrupulous judgment; and I thought his mind was tired. And now he had to prepare his talk for the evening religious meeting. But he revived when I told him that I had been to see the bull and was all for going to the Museum at once. He got his hat and coat and stick, and we set out. "It's curious," he mused on the way, "how closely it paralleled Christianity. They had a sacrifice, a communionand an atonement. The bull was killed in a cave, and that symbolized the resurrection. "—He spoke of his affection for More and told me a curious story. When More had come back recently from Italy, he had announced with gratification and assurance that he had discovered the finest picture in Florence. Gauss had said to him: "I'll bet I can guess what it is! Don't tell me—I'll bet I can guess what you think is the finest picture in Florence! "—and he guessed Perugino's "Crucifixion." He was right; More had been quite taken aback. "But how did you know?" I asked. "Why should he have liked that picture particularly?" "Why, you see Christ way up there—so far above the world." But when we got to the Museum, it was dark, and we found that the front door was locked. We squinted at the Mithraic bull through the glass, but it was scarcely visible now: we could make out only a whitish blur at the bottom of the cavernous entrance hall. We walked around and found a side door unlocked and went in. Obstinately, we climbed stairs, explored galleries, invaded classrooms and studios for classes, with their chalky plaster casts of famous statues; but all the doors into the museum proper turned out to be locked tight for the night. A late student in one of the classrooms suggested we might try to find the curator; but the curator was not in his office, and all the other offices were empty. We walked across the campus and parted, the Dean had to go to the library to look up some more about Mithra, and I remained in his office totype out my letter on Joyce. The visit long haunted my memory, and now the news of Mr. More's death has brought it back into my mind: the empty academic week-end, the new suburban house, the meetings for the discussion or religion designed to bring the students back to town, the Acts of the Council of Chalcedon, the nice old lady with her firm resolution to burn all that old stuff up, the argument over Joyce, More himself with his lifelong consecration to that great world of culture and thought which he had made so more real to others but which he could never quite rejoin himself, and Gauss and I peering at Mithra through the glass.